New research conducted by evolutionary biologists worldwide paints cities as evolutionary "change agents", says a trio of biologists from the University of Toronto Mississauga (UTM) who selected and edited the studies. A compilation of 15 new research papers, published today as a special issue of Proceedings of the Royal Society B, confirms that (a) cities frequently alter evolution by natural selection; (b) species are adapting to cities worldwide; and (c) new commensal species – those that live alongside humans – have arisen in response to the environmental demands and challenges imposed by urbanization. Marc Johnson holds clover"These papers greatly advance our knowledge of urban evolutionary biology," says Marc Johnson, an associate professor of biology at UTM and director of the Centre for Urban Environments. "These are the same evolutionary mechanisms first identified by Charles Darwin more than 150 years ago and the findings from these studies will be increasingly important as more and more of the world's population flocks to urban environments. "It's pretty remarkable. For years, biologists ignored cities, seeing them as 'anti-life', and only recently biologists began to realize that cities are agents of change, driving evolution of organisms living around us and even some living on us." In creating the issue, Johnson co-edited the project with two PhD candidates in ecology and evolutionary biology at UTM, James Santangelo and Ruth Rivkin. Santangelo also contributed a study to the compilation, developing the first theoretical models that predict evolutionary outcomes in urban environments. The special issue contains many other studies that also illustrate its key evolutionary findings. For example, a Belgian study of Daphnia magna, a type of zooplankton of freshwater ponds and lakes, demonstrates that cities frequently alter natural selection. Leuven researcher Kristien Brans and her colleagues collected Daphnia from ponds in both urban and rural locations and put them into holding tanks in the lab. They elevated the water temperature in the tanks and by measuring their protein metabolization and development were able to determine that the urban Daphnia were able to handle the stress of warmer temperatures more easily than their rural counterparts. Given that cities are warmer than rural areas, this ability to adapt to a warmer and often more stressful climate is essential, Johnson notes. 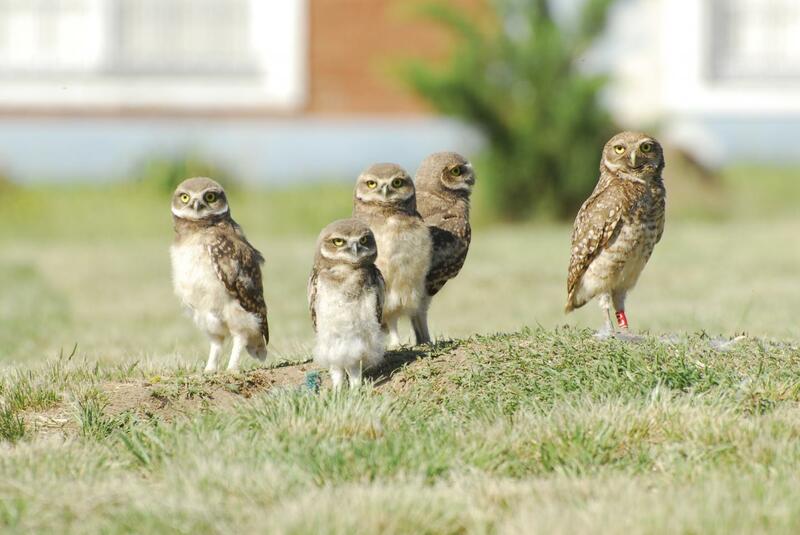 Burrowing owlsParallel evolutionary changes in diverse urban locations are shown by a study of burrowing owl populations in South America, a project led by Jakob Mueller in Germany. He and his colleagues determined that separate groups of burrowing owls native to various South American cities had developed similar genetic responses, even though there was no cross-breeding between the populations. Urban environments share numerous features that likely account for these similar changes. The issue also illustrates how urban areas influence the evolution of invasive species and pests; in many cases, humans become agents for the dispersal and movement of their genes. For instance, Tina Arredondo and her colleagues at Portland State University in Oregon studied the spread of an invasive grass species, Brachypodium sylvaticum, across urban-rural boundaries and discovered that humans were actively involved in its spread, unwittingly carrying seeds as they pursued recreational activities on local waterways. "We are facilitating the dispersal and expansion of the plant's range to new areas," says Rivkin. "Humans are complicit in altering the genetic distribution of a variety of species." The special issue of Proceedings of the Royal Society B addresses some of the most pressing gaps in our understanding of urban evolutionary ecology and points the way forward for further study. "This issue marks the beginning of a very important area of research," Johnson says. "It will allow us to understand evolutionary biology more generally and to realize how important it is for humans and the environment in which we live. It also has important implications for understanding how organisms persist. Santangelo notes that additional research into urban evolutionary biology can also help us become better stewards of our urban environments. "Understanding how cities shape the evolution of urban populations can facilitate designing management strategies for urban pests and help minimize the impact of humans on the spread of invasive species," he says. Johnson adds, "There's lots to explore. This is just the start of a long and interesting road of scientific discovery."